CloudExtend Excel allows you to download NetSuite Saved Searches fast, and for for free. Learn when to use this option here. CloudExtend Excel for NetSuite offers two modes to download NetSuite Saved Searches into Excel. The mode you choose depends entirely on your use case. View this article to learn about the differences in the way search results are displayed in Excel vs the NetSuite UI. Learn how to rename column headers and extract full names instead of internal ID's. This is the fastest way to get your saved search results into Excel for reporting purposes. When you select this, CloudExtend Excel will download data from your search into NetSuite*. Once the data is available in Excel, you can further use this data to create you pivot tables, reports, charts, and even lookup tables for other CloudExtend Excel templates. 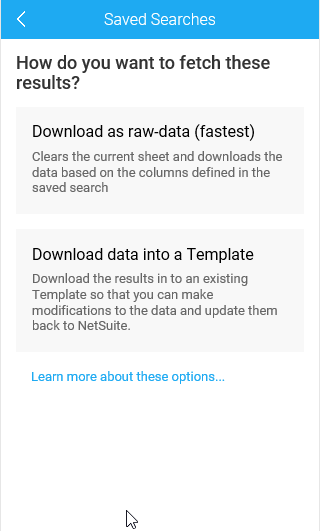 Data download via raw data mode cannot be sent back to NetSuite. Note that the column order of your NetSuite saved search is not respected. Column names may also be hard to decipher (NetSuite passes them over with field names from their web services). It's easy to fix this though, just enter a custom name for your column in the 'results tab' of your saved search. You'll also note that picklist fields (like customer on a Sales Order search) will display the internalID of the record as opposed to the name. See this article for several easy suggestions to address this (note, Enterprise Editions customers with our bundle installed are not impacted). If you are a paid subscriber and you want MODIFY the data you download then you will need to choose the option to download into a template. Note, you could use a saved search for this or you could use your templates data filter. In this scenario data downloaded can be modified in Excel and send back to NetSuite. Downloads take longer due to all the metadata required to also send changes back to NetSuite. *Support for downloading summary saves searches as well as displaying fields with calculated columns is only available to Enterprise customers who have installed the Celigo Cloud Extend CENS bundle into their NetSuite account and are not applicable to Template mode downloads.